Wildfire Golf Club at the JW Marriott Phoenix Desert Ridge Resort & Spa is a must play if you find yourself in the northeastern Phoenix area. Its central location off the 101 between 56th Street and Tatum Boulevard is prime for people coming into town or locals looking to play an enjoyable round of golf or indulge in a resort stay. The entrance to the golf club and resort takes you away from the hustle and bustle of the city and into the Sonoran desert. 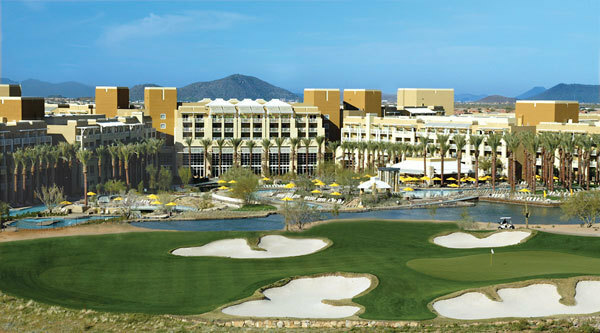 Picturesque views of the McDowell Mountains and saguaro cacti frame the course, giving guests that one-of-a-kind, special desert serenity. If you are a local or are a devoted golf fan, you’ve probably heard of Wildfire Golf Club aside from its many awards and recognitions. Wildfire welcomes the LPGA for the JTBC Founders Cup annually around mid-March. 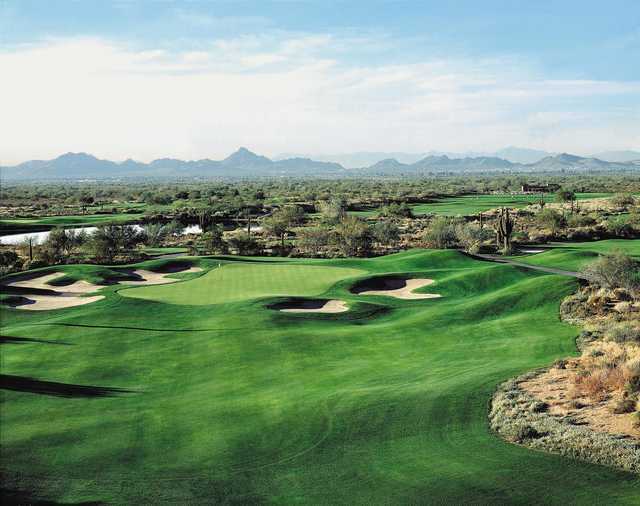 Wildfire offers two 18-hole championship courses designed by two of golf’s distinguished legends to play while on your Arizona Golf Vacation, Arnold Palmer and Nick Faldo. Palmer designed his course with scenic and expansive fairways, making it playable for all skill levels. If you are struggling with the driver, that’s okay! More times than not, your ball will remain in play. Palmer’s goal was to provide subtle challenges throughout the round, just enough to make it interesting, but not too hard where you might leave feeling tricked or discouraged. The Palmer Signature Course is the longer of the two—measuring 7,145 yards from the back tees—and comes with large, undulated greens. The course is heavily lined with bunkers, especially greenside bunkers, which put pressure on approach shots. However, unlike a lot of desert courses in Arizona, the sand found in the bunkers is plush instead of rocky, which makes landing in them much more forgiving. The Faldo Championship Course plays up to 6,846 yards, sits on a 174-acre site and offers a slight variation from the typical desert-theme courses. It features generous fairways, large greens and multiple tee boxes. Over 100 deep-pot bunkers are strategically placed throughout the course, emulating Australian sand belt courses. I was very impressed with the customer service amongst the entire staff. Outside service took care of bags and did a great job making sure my guest and I had everything we needed before we teed off. Tee times ran on time and everyone both outside and inside were a pleasure to talk to. And to top it off, the course was in immaculate condition with smooth, steady-paced greens, even in the dead-beat heat of summer. Now on to the good stuff—all the info you need to know to make your round exceptional. My guest and I played the Palmer Signature course. He played from the Tournament tees (black), while I played the Forward (red). I have tried to include some notes below keeping both playing levels in mind. The first hole is an excellent and short opening hole that requires precision off the tee. Plenty of fairway to work with on the right, but it is hidden from the tee box due to the left bend. There’s a long bunker that hugs the left side of the fairway that is easily seen from all tee boxes, so avoid going in that. Driver is fine to hit, but if you are feeling a little shaky, I recommend 3-wood for more control. Plus it isn’t a monster par-4. Two greenside bunkers line the right side of the green. Before I get to the specs of the hole, I have to acknowledge the golf carts. Each cart is provided with a personal touch screen that measures distance, gives hole previews and course-tips. It was a very nice addition to have. With that said, when we got to the second hole, the touch screen notified us to aim at the cactus through the fairway. There is a wash corridor about 140 yards from the green that is pretty steep. Best if avoided. Regardless if you decide carry or lay short, you will have an easy approach shot in on an open, but narrow green. The first and longest par-5 on the course is fairly standard. The fairway looks much narrower from the back tees than it really is. There are two fairway bunkers on the left that may come into play on your second shot, but all in all, this hole is set up to make par or better. This is the shortest par-4 on the course with a wide fairway. There’s a tree on the right, but it shouldn’t come into play. The tricky shot here is your approach shot due to the front bunker protecting the green. An accurate shot in is a must. Six bunkers border this par 3, two in the back, three left, and one front-left. The green is slightly elevated, so it’s best to club up if you are in between clubs. This hole could set up to be more challenging if the pin placement is on the left side of the green. The 6th hole has a gradual uphill grade. My number one suggestion is to not go right. There is a wash corridor with a lot of bushes and trees, making it hard to find a ball lost right. Your approach shot in is elevated so just go for it. The ball will trickle back down to the hole if you are long. Lastly, watch for the large bunker on the left. Hole 7, a sharp dogleg left, may not look very long, but it is the longest par-4 on the course and definitely plays that way too. So don’t second-guess your yardages. There are no greenside bunkers, making it a wide-open shot in. You have reached the hardest par-3 on the course. This long par-3, following the prior long par-4, is a fun, challenging point in the round. You want to make sure you hit a straight tee shot otherwise you will land in one of the numerous bunkers that line both the left and right sides of the green. The finishing hole on the front nine is another dogleg left that hides the landing zone very well. There is a wash that isn’t easily seen and runs through the fairway approximately 75 yards from the green. A large bunker hugs the left side of the green. While the 10th hole may not be the most attention-grabbing hole on the course, it makes up for it once you are off the tee. The rippling fairway and undulated green makes it more challenging than it looks. There is a nice view of water behind the hole. As long as you do not skull or hit a shot thin, the water should not come into play. Hole 11 brings the water back in view that you saw from 10. If you are playing from the back tees you will hit over the water, but it does not come into play with your tee shot. There is another wash corridor located about 135 yards out from the green, so make sure you plan your shots in appropriately. The green is large, but don’t let that fool you. It is covered in bunkers heavily on the right and has a bunker behind the green that is easily unnoticed if you don’t preview the hole beforehand. Continuing with the theme of left bending holes, the 12th hole is another dogleg left. The green slopes from back to front, so I recommend hitting past the hole and letting the natural slope of the green work its magic. The 13th hole in my opinion is the easiest par-3 on the course. It is a straight shot in with a wide, open green. As long as your tee shot is accurate and doesn’t land on the opposite end of the green from where the pin is, it is an easy birdie hole. Hole 14 is an exceedingly well-designed hole, and is ranked as the number one handicap for both men and ladies. I like to call this hole the “risk and reward” hole because if you play aggressively off the tee, it is possible to get on the green in two. This final par-5 has a split fairway with a wash corridor running up the center. If you happen to hit that perfect shot straight down the middle, no need to worry. The wash area is fairly open. Determine which fairway to play based on the pin placement for the day. This final par-3 is another long one. While it may not look overly complicated from the tee box, the green is actually quite tricky to read. There are several bearings the ball can roll, especially if the pin is placed on top of a ridge. Be confident in your putting stroke on this hole to take out some of the break. The first of the three finishing holes brings us the first dogleg right of the round. It is best to favor the left side of the fairway on this hole for an easier approach shot. Six bunkers guard the right side of the green. Seventeen is one of my favorite holes on the course. The fairway is tightly lined with cacti, trees and bushes, which then leads to a narrow green with water on the right side. Since it is one of the longer par-4s, driver is preferable off the tee, but if you are have any doubts definitely switch to your 3-wood. It is much better to keep the ball in play! The finale hole is a slight dogleg right. A right fairway bunker hides about 260 yards from the back tees. The perfect tee shot will favor the left side fairway, giving a much easier look at the green for your second. Two greenside bunkers protect the front left and right of the green leaving a small margin for error. And there you have it. After your round, go take a stroll in Wildfire’s large and well-stocked golf shop, or grab some lunch and a drink at the Meritage Steakhouse. 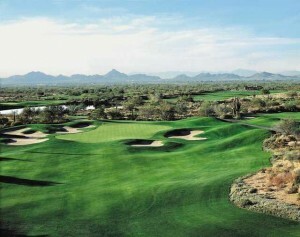 Read all of our Arizona Golf Course Reviews Here! What Do You Think Of This Course? Ocotillo Golf Resort: Who Says There’s a Shortage of Water in the Desert? 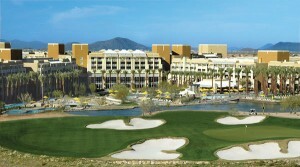 Southern Dunes Golf Club: Best in the West! The Truth Be Told: Don’t Fear The Raven, But Respect It!